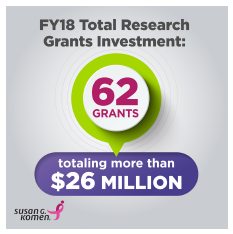 Susan G. Komen®, the world’s leading breast cancer organization, today announced an additional investment of nearly $26 million to fund 62 new research projects that seek to answer some of the toughest questions facing breast cancer. This new funding is part of the organization’s efforts to reduce the number of breast cancer deaths in the U.S. by 50 percent by 2026 and brings its total research investment to $988 million to date – the largest nonprofit investment outside the U.S. government. Since 1997, Komen Charlotte has funded $16,873,937 to community programs serving local women and men, while contributing $6,447,604 to Komen research. “We are so thankful for the friends, family and neighbors that fight alongside us, helping to reduce the number of breast cancer deaths in North Carolina, both on the ground and through research,” said Stamie Despo, Executive Director of Komen Charlotte.